Carlsbad, California, July 23, 2018 – TrumpCard (“TCard”), the expedited air freight wing of Magnate Worldwide, continues to lead the industry with its technology and service dual focus. 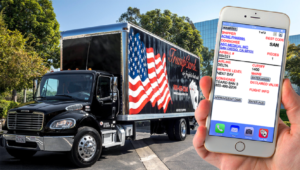 The Carlsbad based freight-tech company has developed and launched a proprietary iOS Application (“app”), called Truck Manager, to assist its drivers in providing true real-time updates to its customers and operations teams. The app sends real-time updates from the drivers’ iPhones to the Ops Team’s proprietary Shipment Manager operations system. TCard has equipped each of its drivers with a new iPhone – an upgrade to a state-of-the-art device preloaded with Truck Manager and other apps that are crucial to the operation. From the iOS devices, drivers can now manage details of the manifest, pick-up, drop-off, and airline information; as well as verifying or modifying the dimensions of the shipment; and retrieving signatures at pick-up and drop-off. All of the input information becomes available to customers and operations in real time via LTE speeds – much quicker than calling data into operations center. Trackability is at its best, with statuses and delivery receipts being available immediately in real time. Since 1995, Carlsbad, CA based TrumpCard has provided expedited air freight and ground solutions to customers around the United States, Mexico, and Canada. The company’s cornerstone is its exceptional customer service and proprietary technology that allow customers with high-value and time-sensitive freight to have dedicated teams watching shipments all over the continent. Find out more at www.trumpcardinc.com.